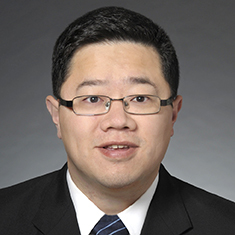 Geoff AuYeung concentrates his practice in corporate finance and represents lenders in single bank and syndicated secured lending transactions. Many of his matters involve secured and unsecured or asset-based leveraged buy-outs and build-ups in the middle market and upper middle markets, ranging in value from $20 million to $250 million. Geoff focuses a portion of his practice on working with lenders in the health care and insurance areas. In addition to senior secured financing transactions for lenders, he addresses and negotiates inter-creditor and subordination issues, restructuring and workouts for creditors and borrowers. Geoff has assisted a number of private equity and public company clients in his borrower-side transactions. As a Registered Representative in the Shanghai office, Geoff assists US companies in expanding to China and Chinese companies building operations in the United States in a variety of corporate and financing matters. He is fluent in Mandarin and can implement multi-jurisdictional and multinational transactions. His representative clients include NXT Capital, GE Capital, BMO Bank, Golub Capital and Madison Capital Funding. Shown below is a selection of Geoff’s engagements.